Must be Synchro Summoned, and cannot be Special Summoned by other ways. This card's maximum number of attacks per Battle Phase equals the number of non-Tuner monsters used as its Synchro Material. Once per turn, during either player's turn, when a card or effect is activated: You can negate the activation, and if you do, destroy it. 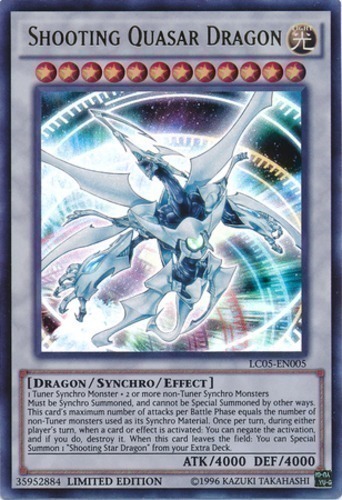 When this card leaves the field: You can Special Summon 1 "Shooting Star Dragon" from your Extra Deck.